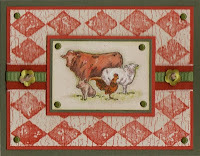 The Shabby Stamper: Farm Life! This is another one of those sets that I really, really wanted when the new catty came out, but put off buying. Watercoloring the animals was the easy part -- the hard part was trying to figure out how to compose the rest of the card. I think that I really need to get the Woodgrain background stamp -- that would go beautifully with this set. I'm really missing Print Pattern and Weathered, so I pulled them out and inked them up. I really wanted to try to watercolor the sheep using White craft ink on Confetti Cream cardstock. I like how it came out! Wowser -- I missed this one!! This is such a "you" card, beautiful watercoloring as usual. I love the colo combo you used, and of course, you know I love those background stamps.